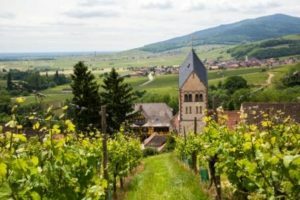 Janine Collier and 12 of her fellow TVR owners were already staying in France, and asked Grape Escapes to arrange a wine tour in Alsace as an extension to their holiday. Before checking into their studios at the 4* Kanzel Hotel Suites and Residences in Bablenheim, the group spent the day in Mulhouse, where they were taken on a guided tour of the Schlumpf Motor Museum. 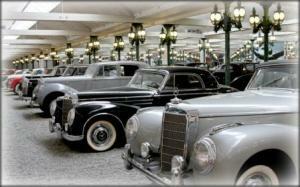 The Schlumpf museum’s impressive collection of cars is as prestigious to the motor world as the Louvre is to the art world! After settling in at the hotel, the group explored the area to find a restaurant for dinner. After breakfast the next day, Janine and her friends took a leisurely walk to Riquewihr, one of the prettiest villages in France, nestled at the foot of the Vosges mountains. After a tour and tastings at the prestigious estate of Dopff & Irion, a three course lunch with local delicacies was served at Domaine Sparr. Here, they met the estate’s 9th generation owner, who proudly explained how he continued his ancestors’ work. Glasses of four wines accompanied the meal, including three single varietal Grand Crus from some of the best vineyards in Alsace. Following a guided tour of the village, the day concluded with a tasting session at an up and coming winery. The following day was spent in the TVRs, starting the day with a leisurely drive to the delightful village of Eguisheim. 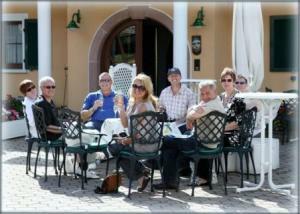 Here, Janine and her group enjoyed a Michelin-starred lunch before continuing their drive to Munster. In Munster, they learnt how cheese is made at an artisanal cheese factory. The remainder of the afternoon was then free for the individuals to do as they pleased. After checking out of the hotel, the group continued their French trip, stopping en route in Ribeauville to explore the famous castle of Koenigsbourg. A guide price for this trip is £575 to £650 per person based on accommodation in twin or double rooms and includes 3 nights’ bed and breakfast in a 4* hotel, a self-drive itinerary for one day, tours and tastings at 3 wineries and 2 lunches with drinks. All of our group tours are completely tailor-made to suit your specific requirements. Please feel free to give us a call on+44 (0) 1920 468 666 or e-mail info@grapeescapes.net to discuss your perfect trip.